James Lasdun. New Yorker. Monday, 22 Apr 2019 09:00:00 +0000. Aurora could be visible in parts of northern Scotland when there is cloud break, with the best locations in rural areas away from towns and cities. Daily Mail. Sunday, 24 Mar 2019 12:32:03 +0000. Auroras occur in both hemispheres, and the aurora in the northern hemisphere is called the aurora borealis, or northern lights. The aurora borealis gets its name from the mythical Roman goddess of the dawn, Aurora, and the Greek name for north wind, Boreas. 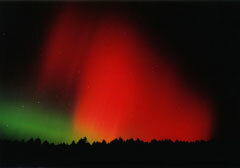 The aurora borealis can often be seen on the northern horizon; it frequently appears as a reddish glow, as if the sun were rising in the wrong direction. 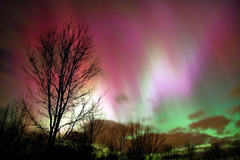 The aurora borealis is most often seen during the months of September, October, March, and April. In many areas on northern latitudes, the aurora borealis was seen as a symbol of approaching doom, and the phenomenon was regarded with fear and superstition. 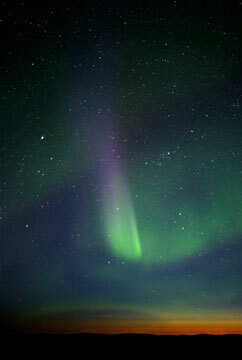 As a result, the aurora borealis is prevalent in folklore and myth, especially among the Inuit people who live in the high, northern latitudes. One myth says that the aurora borealis is past ancestors, while another myth says that the aurora borealis is telling stories of what happened in the past and what will happen in the future. 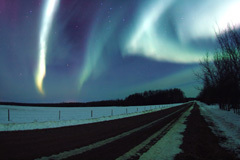 Fairbanks, Alaska, is known as one of the best places in the world to see the aurora borealis. It usually appears in the sky as light green, light yellow, and pink wisps, curtains, pillars, pinwheels, and haloes of light that seem to wave and vibrate. 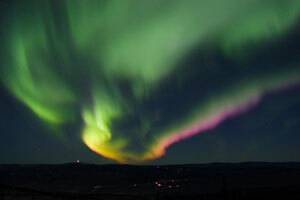 Comprehensive information about the Aurora Borealis, as well as lists of Aurora Borealis resources, can be found on the University of Michigan's Aurora page and the University of Alaska Geophysical Institute's Aurora Forecast page. 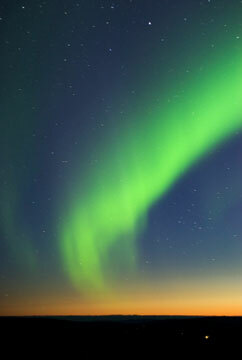 An impressive Northern Lights image gallery can be found at Virtual Finland.